Why It is Okay If Your Babywise Baby Sleeps for 10 Hours at Night. 10 hours of sleep at night is in the range of normal for a healthy Babywise baby. Babywise moms tend to be perfectionists. They tend to put a lot of effort into what they do and want to be sure their child is getting the best sleep he/she can get. When a Babywise mom reads that her child should be getting 10-12 hours of sleep at night, she sees only 12. 12 is higher than 10 and therefore better than 10. But of course, not all babies need to sleep 12 hours at night. Some babies have low sleep needs. I often see questions about moms concerned because their baby is only sleeping 10 hours at night. 10 hours of sleep is absolutely okay! On Becoming Babywise (affiliate link) says baby should get 10-12 hours of sleep at night. A range is given for a reason. I know 12 hours is lovely (I have had those babies! ), but if they don’t need it, they don’t need it. Brayden has NEVER been a 12 hour sleeper. His longest has been 11.5 hours, and that was once he went down to 1 nap a day at 17 months old. People vary in the amount of sleep they need. I need about 7/7.5 hours at night. My sister needs at least 9. There is that optimal length of sleep for everyone, and it varies from person to person, and baby to baby. So if your baby is happy and alert while sleeping “only” 10 hours at night, then that is likely his optimal length. There is no reason to stress if your baby is a low sleep needs baby. As you drop naps, you can most likely shift more sleep to the night (and you will probably need to) because when children drop naps, they rarely drop sleep totals, they just arrange it. Read more about dropping naps in this post. Of course if you baby is cranky and sleepy after 10 hours at night, he likely needs more sleep. So work on figuring out the reason he isn’t sleeping the optimal length for him. For help getting baby to sleep through the night, read this post. You can see also What to Do When Your Baby is Not Sleeping Through the Night. If you would like to know what sleeping through the night looked like for my individual children, see Sleeping Through the Night, a Tale of Four Children. Just remember, if your baby doesn’t need to sleep 12 hours at night, that doesn’t mean there is anything wrong with him or anything you are doing wrong. It just isn’t what he needs. I will leave you with something to look forward to. If you have a low sleep needs child, there are benefits and perks in your future. A low sleep needs baby will be a low sleep needs person on through the years. That means your low sleep needs baby will be a low sleep needs preteen and teenager. This means your teenager will have an easier time getting out of bed in the mornings for school. My high sleep needs children are much harder to get out of bed in the mornings than my low sleep needs children (truth be told, I don’t even have to get the low sleep needs children out of bed. They get up on their own). What feels like a concern today will be a major perk in ten years. 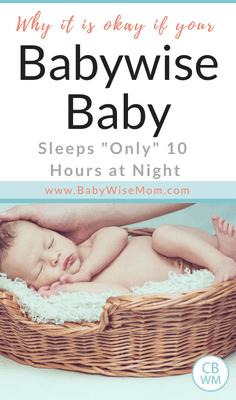 Now that you know it is okay for baby to be sleeping “only” ten hours at night, be sure to read through my Babywise Baby First Year Overview so you know what milestones to expect when. Next Post What was/is baby’s approximate optimal waketime length for ages 6-8 Weeks? (waketime length includes feeding time)? Thanx for all ur informative blogs.They helped us a lot. I was so much disturbed in last days because of baby nap problems then I read on ur blog that so many people including you mentioned that babies have nap problems around four months, so keep on trying. I am relieved now and waiting but keep on trying.1. is it good to sleep baby on same place where she slept at night?my baby sleeps on bed at night and during day in swing. will it help her if she sleeps at same place.?2. what babywise says about thumbsucking and what do u say about it. my baby does it at sleep time just to soothe herself. I am worried will she able to break this habit at later age or not.3. She still screamed when I give her rice cereal , I think she is not ready will give her next month. Two of my kids have (happily) only slept 8-9.5 hours at night until they drop down to 2 naps! And I adhere to every BW rule! Some kids just don’t need the amount of sleep that BW suggests. I am new to this blog and I love it, thank you! My 4 month old is on a 3 hr schedule, waking up at 6am with last feeding at 8:30. I have 2 questions, the book says that at this age he should only be taking 3 naps, how does that work if he is eating 6x’s a day if I follow feeding/waketime/naptime schedule. should he only nap after certain feedings? Secondly, how can I adjust my schedule so my day starts at 7a instead of 6a? Proudmum,You are welcome!1. Yes, good to sleep in a consistent type of location. My children both vary what bed they sleep in, but it is always a bed. I would recommend starting to wean your child from the swing. It can be a good backup, but you don’t want it to be the only place he sleeps.2.BW says once the child hits 6 months, to not allow it during playtime. I personally prefer thumb/finger sucking over other alternatives, but everyone has their preferences. If you just remove it from your child’s mouth starting at 6 months during playtime, it should be fine. I am currently reading the Baby Whisperer, and she also says thumb sucking is fine.3. Sounds good. Emily, that is going to depend on the mom. For the book, STTN means sleeping 7-8 hours straight without disruption. For me, I don’t say STTN until baby is sleeping longer than the hours I like to sleep. I typically sleep 10:30-6:30 (sometimes I go to bed later). I don’t say baby is STTN until he is sleeping from the dreamfeed (which I do around 10) to waketime in the morning (for Brayden, 7 AM, for Kaitlyn, 7:30 AM). So that is my definition.It will depend on the mom you are talking to. 🙂 I think STTN for most BW moms means 7-8 hours. It then becomes sleeping 10-12 hours. Thanks for your added thoughts Kaysmommie3. It all depends on the child. Thanks! I was just wondering if I could tell other BW Moms that my daughter was STTN! thank you! hope you enjoyed your time away! I wanted to see if I could get your opinion on something. My 8 mo is FINALLY sttn (I waited longer then I should have to do CIO, but we’re there now!) She used to be in bed from 7-7 but she is now only sleeping until 6 am. Im trying to figure out what the cause is….hunger, not enough wake time during the day, a phase, or if she needs less night sleep now. Do you have any suggestions on how to figure this out? I am still doing a 10pm df but wanted to try and drop that soon, but obviously not if its a hunger issue. Thanks! I’m so glad I found this website. Thank you so much for taking your valuable time to put this together. This is my first time here but has gr8 info. I’m having a sleep issue with my 12 week old. She started sleeping through the night at 10 weeks. Last feeding at 8:30 down to sleep at about 10 to 10:30. THen a dream feed at midnight(we stay up late) and then at 10 weeks started sleeping till 7 or 8. HEAVEN!! Now she keeps waking up somewhere between 4:30-5:30. Last night I put a 2tsp cereal in bottle and slept from 12:45-6:30. I don’t know what to do…but I’m so exhausted from getting up at 4 or 5. What do you recommend? ?Also does the dreamfeed have to be at exact time every night? I figured it didn’t since there is no wake time after. Again thank you so much! My LO is 27 weeks. He has been STTN consistently since 5 weeks. In the past couple of weeks, I have noticed that he has been waking early. His normal wake time is 7:30. Lately, he has been waking anywhere between 6:30 and 7:30. I have moved him into a bigger size diaper at night. Last night, though, I noticed he was very wet. He goes down between 8:15 and 8:30. He normally wears a size 3 diaper, and at night a size 4. He is not near the cutoff weight for the diapers so I’m surprised he is very wet. We have been on solids for a while now. I don’t know the cause. Could he be hungry? Normally he gets solids + bottle at 7:30, 11:30, and 3:30, then a bottle at 7:45. This would mean he would be getting solids at 4 meals. The other thing is that he does normally talk to himself, while sleeping, around 5:30am. I know BW says this is normal, but for how long? I just can’t figure out why he is waking early! Thanks for your help! Shawna – I’m goign through that now and I just try to stretch him out as much as I can throughout the day to make up and stay as much on schedule as possible. I think mine is on a 4/4.5 hour schedule. Most of the time I do the stretching in teh evening. But, if he sleeps a little longer at a nap – to make up the time – I don’t wake him. So, you can finagle times here and there. That’s what I do! It sounds like this is a common thing around 7mo babies. I think that it has to do with teething, but who knows! Hope that helps! Any thoughts on giving a breastfed infant a bottle of formula for the dream feed instead of breastfeeding? I know formula can keep a baby full longer and I didn’t know if it would help dropping that middle of the night feeding quicker. Maybe this is a no-no. My daughter is SO close to dropping that middle of the night feeding, she normally wakes at 5:30 for it, and for her morning wake time feeding at 8:00 she often doesn’t eat well. I’m wondering if formula will help her make it longer, or maybe I just need to be patient. so, scratch that last comment, she slept through the night on her own the past two nights…I knew she’d come around! I’m glad it worked out Janna! She is still young. At that age, she still needs at least 8 feedings and possibly 10, so depending on the number of feedings in the day, that sounds pretty normal. She should most likely move to one feeding a night before too long. Okay I am searching help and I am starting to understand…but if anyone could add more insight I would be forever greatful.My dd is 3.5 months. I just started babywise (longstory why it took my so long). She is 15 pounds and some change. She has been eating somewhere between every 3-4 hours…and naping sometimes for 1 to 1.5 hours. She sleeps for 6 hours wakes to eat and then sleeps for 2 more. I am not sure what kind of schedule I should keep for her. 3 hours? 4hours? And she wants to nurse before she goes to sleep…so I am just lost…but I am getting better. Hi, my son is over 13 months old when he wakes up during the night (only has been happening for a few nights, so it must be teething or an ear thing) should I peek in a make sure everything is ok ie, too cold in room or too hot in room, or should I just let him be? Thanks. Valerie, my daughter will be 5 months next week. She has 3 naps a day typically, we have just dropped the 4th nap recently. Her waketime is supposed to be 7:00 a.m. I usually put her down by 7:30 but she’s been waking up at 6:30/ 6:40ish a.m. for the last few weeks. I am fine with her only getting 11 hours of sleep at night as this post says but is there a way to shift her sleep so she’s waking up at 7:00 a.m. again. I like to get up, pump, read my bible, etc. Should I just accept a 6:30 waketime as her biological clock? When she wakes up at 6:30 she is usually talking/playing and I wait until 7 a.m. to nurse. But then her schedule is off because she goes down for that first nap early. Mommamimzy,I am sorry I missed your question! Please let me know if you are still having trouble. Forbitus Marketing,I am sorry I missed your comment also! I think I would wait about 5-10 minutes to see what happens. If he doesn’t fall asleep after that, I would go in and check everything out. If you are waiting and can tell from his cry that something is really wrong, I would go in right away. Wise Family Blog,you could try to change her overall schedule slowly by checking out the strategies with the blog label “Time change”Another option is to go with it for a couple of months when we will have the next time change. 6:30 will be 7:30. At that time, you could just shift her schedule 30 minutes. It is much easier to get them up 30 minutes early than to have them sleep 30 minutes later. I hope you aren’t getting my post twice. Tried to send earlier, but internet had gone down…We have been following BW since the birth of my daughter. She is now 13-weeks old and breastfeeds throughout the day every 2 1/2-3 1/2 hours and naps well for 1-2 hours. Her late afternoon nap tends to be 45 min to 1 hr, at which time we let her stay up until her bedtime so my husband can interact with her. Her last feeding is around 7p and bedtime is around 8p. She has never been a dream feeder, as I can’t wake her up to eat (or if she “snacks” she wakes again for MON feeding). My concern is that she still wakes independently sometime between 12-3 am for another full feeding and isn’t making it to the 9-10 hour mark typical for her age. Should I begin tring to stretch her to at least 9 hours so that she can easily adjust to the 12 hour mark once she gets older? Or, should I continue to feed when she wakes independently once between 12-3? Right now, she only makes it 5-7 hours between the last feeding and the MON feeding. Her daily wake time is around 7. If she does make it to 3:30/4 (which isn’t often), she usually isn’t very hungry for her morning feeding. What do you suggest? Or, another thought….should I try squeezing in an extra feeding to give her 6 daytime feedings? Then, wean her off of the MON feeding by reducing her feeding time? Right now, she gets 5 daytime feedings and 1 MON feeding. Hi! I recently found your blog and find it very helpful. My baby is 5.5 months old and is exclusively breastfed right now. We are thinking about introducing rice cereal since he used to sleep through the night and the last couple days he has been very hungry and waking up early and in the middle of the night. He wakes up crying every morning about 5:45-6:00 a.m. and I typically feed him right away. Is it normal for babies to wake up crying? Thanks for your help. Hi. My daughter will be 6 months old this week. She has been having sleep issues both night and nap for the last couple weeks. We were on vacation out of state when it all started so we didn’t worry and just made do as she was in a new environment daily on our trip and we couldn’t have the same expectations of her. She stared to wake early in the morning on vacation. I wasn’t sure if this was due to 2 hour time change, a different bed/environment, bad naps (often in the car seat/stroller) or another issue, Although we took her paci away a couple months ago as she would wake every hour at night for us to put it in when it fell out….we were using the paci to put her back to sleep on our trip early in the morning hours and keep am waketime 12 hours after she went to sleep the night before.Since we have been home she has continued this habit and so have we. Partly because the day after we got home she started a pretty bad cold and cough and I wasn’t ready to do CIO in the am as she was pretty miserable and couldn’t breathe. She was waking around 4, but has now pushed it to about 6am. Her wake time is 8am. DO YOU THINK SHE MAY NEED LESS SLEEP NOW? MAYBE 10 OR 11 HOURS A NIGHT AS OPPOSED TO 12? She does go back to sleep though so this makes me think she needs it. I am not sure if this cold she has had for nearly 2 weeks is teething? She is chewing everything. HOW SHOULD WE HANDLE THIS ISSUE? KEEP GOING IN AS IS UNTIL SHE STOPS WAKING? CIO ALTHOUGH SHE IS NOT FEELING WELL? NOW SHE SEEMS TO TOTALLY RELY ON THE PACI AGAIN DURING THOSE HOURS. This morning I fed her at 6am and put her back in bed, she seemed so hungry, I haven’t done this in months. She took a good feeding, slept 2.5 hours more and still took a full feeding and her solids at breakfast. I know she maybe in her 6 month growth spurt. SHOULD I FEED HER IN THE EARLY AM HOURS UNTIL SHE STOPS WAKING OR IS THIS REGRESSING?NEXT ISSUE….She has always struggled with naps and was a 45 min sleeper before. In the last couple months we have got her to sleep more than 45 minutes, usually 1.5 but rarely 2 hours using CIO. However lots of days usually have either am or pm nap are 45 minutes. I have always struggled with do I use the clock or the nap cues? I have never figured her out as she always rubs her eyes at a different time during wake time(sometimes as early as 1 hour or even 2.5 hours into waketime.) I have put her down at that time even if it seems early. She will then usually wake 45 min later. I think she needed more wake time. If I wait what I think should be her wake time length, 2 hours- 2 hour 15 min she wakes at 45 min again. DO YOU RECOMMEND FOLLOWING THE CUES OR THE CLOCK? I ALWAYS HEARD 45 MIN WAKE IS NEEDING MORE WAKE TIME OR COULD IT BE OVER TIRED? Sorry this is so long and thanks for all your help especially with your newborn! Care’s Kids,It is possible she needs less sleep overall in the day. You have definitely created a habit that will have to be broken at some point: the pacifier. This could be the reason for her waking, also. But there are so many factors going on. It is always the hardest to troubleshoot when you have so many factors. I don’t think I would feed her; that is adding more issues for you to break in the future. Be careful of quick fixes because a quick fix becomes a long fix later on.However, I would wait until the cold is gone before trying to fix the issues. Treat the teething symptoms also.For waketime, babies won’t necessarily have the same waketime all day long. It is dependent on the time of day and also the nap preceding it. For example, McKenna almost always is on a 3 hour schedule with at least a 2 hour nap. Sometimes she will eat at 2.5 hours, which puts her at a 1.5 hour nap. For the waketime following her 1.5 hour nap, it needs to be shorter than following a 2 hour nap. It isn’t a huge difference, only 5ish minutes, but it is different.No, a short nap for a baby that age means too long of a waketime and/or overstimulation prior to the nap. Follow cues unless cues are not present, then follow the clock. But when you follow the clock, you will in the end be following cues because you will adjust length based on the nap. First, let me say how grateful I am for your website and your commitment to providing assistance to those of us who follow the BW methodology. I started BW when my son was four months old, at the advice of an acquaintance, at a time when I was surviving on less than two hours of sleep at a time at night. My son, who is now five months old, has been STTN for about a month now. My problem is that I have not consistently followed a waketime as it varies day to day (his bedtime is always between 7:45-8:15). There are days he wakes up at 5, 6, 7:30 (on Mother’s day, what a gift) or, like last night, 4am. If he wakes before 6am, I will let him CIO to see if he will fall back asleep on his own, but if he cries for longer than twenty minutes, I will feed him and put him back to sleep, Some times he will take a full feeding; other times he won’t which makes it really confusing. He will then sleep another two hours at which time we get up for the day. Because the waketime has been erratic, we have not been able to establish a schedule. Instead, I will just follow a combo three or three and a half hour cycle with nap times in between. He naps very well during the day, by the way.I have read through your various posts to try and find a solution, but I must admit I don’t have a clear cut remedy. I believe you might tell me to either do a dream feed at night (consistent time) to let him sleep longer in the morning, but I’m afraid that at five months, I might be going backwards rather than forward. Or, that I should feed him if he wakes up very early and then wake him up at the designated time that I want him to start the day. I would greatly appreciate your advice on what you think may be most appropriate for my son at this age. I feed him five times a day (combo three to three and half hours) and solids once a day at 5pm. I tried feeding it to him before his bedtime, but I’ve found that doing so doesn’t make a difference. I also tried giving him another serving of solids in the morning, but I found that this may have filled him up too much, thus making him a lousy eater the rest of the day and creating the 4am waketime. Lastly, if you would please give me some direction on how much solids he should be eating per serving. At his 5pm feeding, I give him 1 tablespoon of oatmeal mixed with 1 tablespoon of yams (runny yogurt consistency). Sorry for the long-winded post. Thank you so much for your website – i often read it for advice! We have an almost 15 month old who, since very little has consistently slept from 8pm-8/8:30am. Within the last two weeks, he has been sleeping from 8-6:30am!! He wakes up grumpy but no matter if we let him cry, he won’t go back to sleep. He was doing a few days w/o morning naps for the past month and now needs them b/c he’s so tired in the morning. He seems to be going backwards – early to rise, needing 2 naps and i don’t know what is wrong. We’ve tried putting him to bed earlier and still nothing. I know that 8am is asking a lot – so i’m asking even for 7am and most importantly, a happy baby in the morning. Do you have any solutions or techniques i could try? Thanks for your help! jake’s space, you may try putting him down a touch later? With my daughter (15 months), if we put her down 15 minutes early at night, she’ll wake up an hour early in the morning. I’m amazing at how such little differences at night can make such a huge difference in the morning. You mentioned you’d tried putting him down earlier, so I just thought I’d mention that maybe going the other direction for a few minutes would help. I sure hope so, because 6:30 is too early for me! 🙂 Also, Valerie has mentioned that the sun rising earlier affects her kids so they wake a little earlier. Maybe make sure his room is dark enough? Susan,With Kaitlyn, we dropped the dreamfeed at 7 months old. She likely was ready much younger, but we kept it that long. Hogg (author of the Baby Whisperer) says to drop it around 7-8 months. SO, adding it right now wouldn't necessarily be regressing, especially if it allowed you to get more consistency to your days. See this post for different options with those early morning feedings. In the end, you need to pick a waketime and stick to it within 30 minutes. You can change that morning waketime, later, also. It can be 6:30 now and then move it to 7:00 or 7:30 in a few months. Pick what is doable now.Early Morning Feedings Before Waketime: http://babywisemom.blogspot.com/2008/01/early-morning-feedings-before-waketime.htmlSee the blog label "solids" for more on how much baby will eat. It really varies from baby to baby. See the blog "super baby food" for info about a book that can guide you there. Jake's Space,I have a few thoughts. The best thing to do is to think back to what changed when he started waking early. Is that when naps changed? If that is when you dropped a nap, he might be overly tired and therefore not sleeping well at night. It might also be due to the sun rising earlier. My children rise with the sun. When it is sunny, they are up at 6:30 AM. When it is cloudy and rainy, I wake them after 7:00 AM.Try Jennifer's ideas too–but try moving bedtime slowly. Even 5 minutes can make a difference. (Thanks Jennifer! )In the end, think to when he was sleeping well and when he started waking early. Compare the situations. Try to get things to how they were with a better morning wake time. If he still needs two naps, don't feel like you are regressing. Most toddlers drop the nap at 18 months (this wouldn't be an average, it is most), so he wouldn't be "late." Hi there, Thanks so much for taking the time to have this blog. I don't know how you find the time with 3 kids but it's so helpful! My question is about my almost 10 week old son… We've been implementing BW from the beginning and because of that, he's been on a predictable 3 hour schedule since early on which has been great. However, he's still waking up at around 3-3:30 every night no matter when I do his DF. I've tried doing that feeding anywhere from 10:30-12:00 at night and he seems to wake up at 3-3:30 no matter what. Additionally (and harder for me), he's been waking up at 5-5:30 every morning now for the last few weeks which doesn't make sense to me since he's just eaten 2 hours earlier. I try and hold him off until 6:00 most mornings and sometimes I can because a lot of times he's not even really awake at 5. He just sort of whines for a bit and then goes back to sleep for a little while but he'll do that constantly until I get him up to eat. This isn't good for me of course because I don't want 5ish to be his first feeding time. I don't even want it to be 6 but I would settle for that right now :)! I'm anxious for him to sttn but it doesn't feel like he's stretching his night time sleeping out at all. So my questions are this: 1) Do you have any suggestions for him not waking up at that 5:00 hour or do you know why he may be doing it? 2) Do you think since he's waking up at 3-3:30 every night consistently that I should try to let him CIO? 3)Should I just go with this as his schedule for now and hope that he eventually stretches it out naturally in the next few weeks? 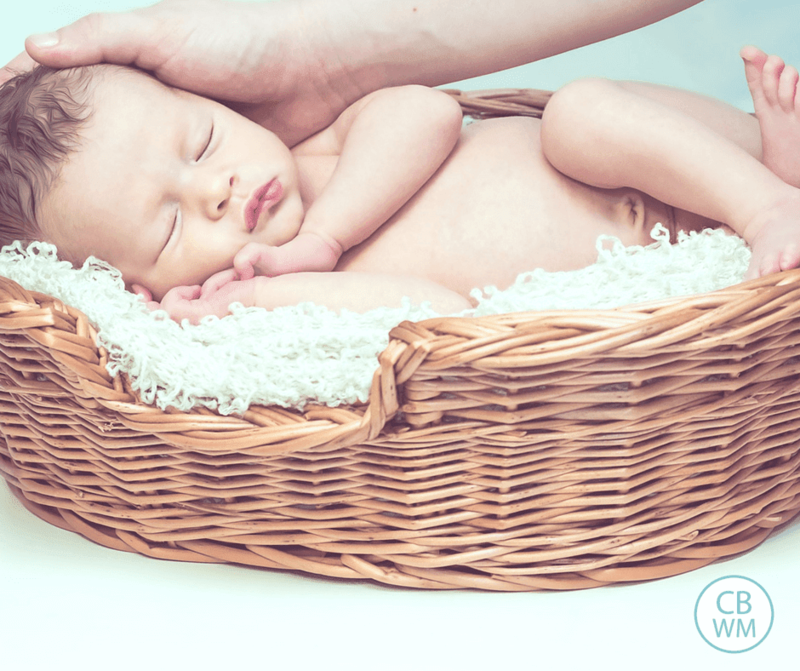 On a separate topic, how have you weaned your kids off of the swaddle? My son loves it but he's getting strong enough to get his arms out a lot of times and when he does he'll wake up until I get up and re-swaddle him in the night. Thanks so much for your help! 1- See the post "Nighttime sleep issues" and also "naps: troubleshooting" for ideas as to why a baby would wake up. 2- That is up to you to decide. If you think you will see it through to the end and that he is ready for it, go for it. But be sure you are sure and that you will do it before starting.3- I always like to wait until 12 weeks before messing with nights.See the blog label "swaddle" for more info on that. Maybe you have discussed this somewhere, but I can't seem to find such blog. In BW I, it says "be mindful of your milk production" when STTN and that you may not have "adequate stimulation during the day" if baby sleeps more than a certain number of hours. Does that mean your milk supply will start dwindling if your LO sleeps too long at night, or what does the author exactly mean? Can one go 12 hours without BFing and then still have adequate supply for the day? SAmom,That means that for some moms, if baby goes too long between feedings, milk supply will diminish.This isn't true for all moms, but some.I always follow their rules for sleep precisely so far as how many hours to let pass before waking baby up for a feeding.I can go 12 hours just fine without breastfeeding. Some moms find they can't; those moms usually pump before they go to bed and that is sufficient.I think once McKenna drops her dreamfeed, I am going to pump at the dreamfeed just to have milk stored up. I think it is a great idea. Your body is already used to it. Might as well continue on! Sally Ann, you are welcome 🙂 I would say that you should first wait until the four month issue is past. 4 months is a rough time for all babies, not just BW babies. See "wonder weeks" for more.Second, if you do have a 10 hour at night baby, I would try having a bedtime 10 hours before your morning waktime (desired). See if sleep is still at 10 hours, or if morning waktime is still at 5:30. But, before I moved bedtime back, I would be sure baby isn't too hot or too cold or there is some noise going on that is waking her. If she still wakes at 5:30 then you know it isn't that she just needs 10 hours, but that she is waking at 5:30 for some reason.There is also a possible flip side. Babies will wake early in the morning if they are overly tired. She might actually be a 12 hour baby waking early because she is in bed too late. Good luck! My nearly 6-month-old still only sleeps 9 hours at night. Any ideas on how to help him sleep longer? He still has 90-minute waketimes and 4 naps (usually) a day, but seems to need the last nap. When I put him to bed earlier (sometimes with and sometimes without that 4th nap) he often just wakes up earlier in the morning. Once I gave him a dreamfeed in his sleep because he was extra tired and was put to bed before his last feeding (I'm breastfeeding so I didn't want to go too long) and he woke up extra early the next morning (after 9 hours) but he ate late so he shouldn't have been hungry. Is there something else I can try to help him sleep longer? What is his napping schedule and what is his bedtime? A 6 month old really should be down to 3 naps. Some only take two. Even my heavy sleeper girls went to 3 at 4 months. So I would say he needs to drop the fourth nap and move bedtime up. He's sleeping 10 hours now without a problem. I think he just had to get used to it. We've also dropped the 4th nap. I'm so confused about when/where my daughter is supposed to sleep! She is 2.5 months old. She is on a 3 hour schedule and it goes something like this…7am – feed, wake, sleep about 1.5-2hr nap10am – same1pm – same4pm – feed, wake, maybe 30min-1hr nap (gets fussy about 6pm)7pm – feed, wake, 0-30min nap (usually cries a lot)10pm – feed, bedFor the last 2 weeks, she has been sleeping 8 hrs at night consistently. Should I be putting her to bed at 7? And if I do that won't she be getting too much sleep? When do they start dropping naps? Is she sleeping too much during the day? Right now she has been sleeping different places for naps…swing, floor, car seat (when I have places to go)…should she be sleeping in her crib for naps too? Thank you! Just wanted to add: take a look at my post from 2009. Need I say more? jcaitlyn,Put her to bed after her 7 PM feeding. She won't get too much sleep. You will still do a 10 PM dreamfeed. Naps start to drop at 4 months old. The crib would be best for naps. She might be having witching hour in the evening, see my post on that for more. Good luck! My daughter is 18 months old and has always been a 12 hour nighttime sleeper until we went to 1 nap a day. Now she seem happy with just 11 hours. My dilemma is that I've always started her schedule at 7 am. Now she's waking earlier and I don't know what to do. Her bedtime is 7:30 and I hate to move it later because she is truly tired by then. And it doesn't seem to matter if she does go to bed late on occasion. She still gets up in the 6:00 hour. She is taking a 2 hour afternoon nap. Any suggestions on how to adjust the schedule so we start at 7 again? My son is 9 months old. I put him to sleep at around 7 every night, he wakes up at around the 4 o'clock hour every day. It's not always 15 minutes close to the hour so I am not sure if he is "stuck" at this time. He is only sleeping 9 hours . I feed him and put him straight back to bed. He usually sleeps till around 6:30, which is a desirable wake time for me. However, this week he has started to play in his bed and does not go back to bed. I am not sure how to get him to sleep later. I am struggling keeping the 1st feeding the same bc he is not as hungry at 6:30. I don't want 4 something to be the his first feeding. How can I stop this feeding and get my desired wake time? Do you think he could only need 9- 9.5 hours of sleep a night? Thank you for all your posts they're so helpful. Hi Sandy, you could try a 7:30 or 8 pm bedtime and see if that changes when he wakes in the night. If it doesn't, he is likely waking out of habit. In that case, I would try to break the habit in one of these ways:1-CIO 2-wake to sleep (from the baby whisperer–you basically go in and rouse him a bit, not fully awake, about 10 minutes before he would normally get up). 3-rock him to sleep when he wakes–don't feed him. That way his body can get used to not eating in the night. 4-slowly cut back how much he eats in the night. Good luck!